Even though Laos is quite richly endowed with surface water compared to many other countries, the availability of the resource is becoming more and more uncertain and unreliable due to rapid economic and population growth which is leading to escalating water demand. The exploitation of groundwater and use for domestic, industrial and agriculture would be necessary and is constantly increasing in Laos. However, there is limited data and information related to groundwater, improvement of coordination between sectors on groundwater management is needed and identification of clear responsibility and role of each sector to groundwater. A Crawford Fund supported visit to Australia for Mr. Kanya Souksakoun from the Faculty of Environmental Sciences at the National University of Laos; Mrs Bounyaseng Sengkhammy of the Water Resources and Environmental Research Institute at the Ministry of Natural Resources and Environment and Khaikeo Keokhamphouy from the Faculty of Engineering at the National University of Laos was a good start to capacity building to strengthen the knowledge and skills on groundwater resources management in Laos to the staff of government organisations, according to the participants. “It is also supporting the cooperation between the sectors working on groundwater in Laos with international groundwater-related organisations,” they reported after the visit. Also, according to the participants, the training which was held over 8 days provided a great opportunity for them, particularly as staff at academic/public sector institutions with interests and responsibilities related to groundwater, to gain the technical knowledge and skills on groundwater management in both theoretical and practical aspects. 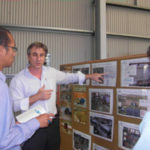 “The training mainly focused on the issues of groundwater management system in Australia, including technologies and techniques adopted to solve the problems, but the overall principles provided by the course can be applied internationally,” they noted. The visit included training at the Australian Groundwater School, Flinders University and visits to Flinders University and University of South Australia to discuss postgraduate study opportunities and linkages. “Overall, Laos is still in need of support for technical assistance for strengthening the capacity of technical staff of government agencies working on water resources; in particularly groundwater resource which will be more and more important in future,” they concluded in their report.